Flaubert's nervous condition was recognised by many contemporary physicians as being epileptic in origin, not least by his father, Dr. A.-C. Flaubert, who was an experienced doctor, respected by patients and colleagues alike. Flaubert's first seizures appear to have started in his sleep, but they later also occurred while he was awake. 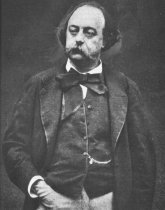 Flaubert's own descriptions of his seizures and the reports of some of his contemporaries show that he could feel when a seizure was going to occur, i.e. his seizures were preceded by an aura. The course of Flaubert's epilepsy was very variable. He had his first seizure at the age of 22, followed by four further seizures within the next two weeks; after this he had increasingly fewer seizures and was actually seizure free for several years (e.g. during his trip to the Orient in 1850/51). Then, however, they began again with increased intensity from about 1870/71. It is no longer possible to ascertain whether Bromine, the only effective anti-epileptic drug which was used at that time, and which Flaubert took in large doses, had a positive effect on his seizures. At the turn of the century, there was a passionate and controversial discussion in (predominantly French) circles as to whether Flaubert died during an epileptic seizure or whether his death was caused by an apoplectic shock. Today, if we read the accounts describing in detail the day of Flaubert's death (May 8, 1880), we can say with some certainty that Flaubert did not die during an epileptic seizure but as a result of an apoplectic fit.